A recent United States Air Force scramjet test has hinted ata future where hypersonic vehicles streak through the sky at many times thespeed of sound around the world, and perhaps even open up access to space. The experimentalX-51A Waverider used a rocket booster and an air-breathing scramjet toreach a speed of Mach 5 and achieve the longest hypersonic flight ever poweredby such an engine on May 26. That technology might not only deliver cargoquickly to different parts of the globe, but could also transform the spaceindustry and spawn true space planes that take off and land from the samerunway. The wealth of possibilities offered by aerospace vehiclesthat can ride their own shockwaves likely explains why the project has drawnsupport from the Pentagon's Defense Advanced Research Project Agency (DARPA),NASA, and the U.S. Navy. Scramjet engines can alsoeliminate the need for much of the huge oxidizer tanks carried by rockets,because the engines capture oxygen from the air to mix with the fuel whilemoving at hypersonic speeds. That would permit future space-lift systems orspace planes to carry greater payloads and operate more efficiently, Brink said. That concept naturally excitesNASA, as the American space agency has continued to consult with the Air Forceon the X-51A project, as well as the HIFiRE Flight 2 scramjetexperiment. "NASA would ultimately like to enable large vehiclesfor access to space using air-breathing propulsion," said James Pittman,principal investigator for NASA's hypersonics project at the NASA LangleyResearch Center in Virginia. But first, military and civilian researchers will have torefine the scramjet engines that marks a significant break from past jet enginetechnologies. Lockheed's supersonic SR-71Blackbird could reach speeds of Mach 3.2 during its operation from the 1960suntil the late 1990s. The stealthy recon aircraft relied upon turbojet-assisted ramjet enginesthat compressed the flow of incoming air at high speeds, but slows down theairstream so that engine combustion takes place at subsonic speeds. By contrast, scramjet designsallow for the airflow throughout the engine to continue traveling at supersonicspeed. That raises the speed limit to hypersonic speeds of around Mach 5 ormore. The first flight tests of ahypersonic scramjet vehicle came from NASA's X-43A project, also known asHyper-X. Its test flight reached Mach 6.8 in March 2004, before a followingtest flight hit Mach 9.6 in November 2004. That's about 7,000 mph (11,265kph), or three times faster than the SR-71. The Air Force's X-51A Waveriderhas since drawn on many of the lessons from the X-43A, even if the newerexperimental vehicle packs a more sophisticated and complex scramjet engine.The X-51A has claimed the longestscramjet burn during its 200-second flight test,but has yet to break the X-43A's speed record. "Hyper-X provided ajumping off point for the X-51 program in many areas," said Kenneth Rock,head of the hypersonic air-breathing propulsion branch at NASA Langley. Rock and his colleagues had already done many wind tunneltests and computer simulations during the X-43A program, and found that themodel data fit pretty well with the actual flight tests. That gave the X-51Aprogram a confidence boost from knowing that there were fairly few unknowns notcovered by modeling, Rock told SPACE.com. The NASA researchers not only shared their experiences withthe X-51A program, but also helped participated in an independent review of theongoing Air Force project. They added some tips about how to streamline flightoperations come testing time for X-51A, which flew a route not unlike what theX-43A had taken from the U.S. West Coast over the Pacific. If scramjet technology advancesfar enough, it could become part of a system that helps propel unmanned ormanned vehicles into space. Spaceplanes might even emerge that can fly into spaceat just about any time, without launch window constraints. 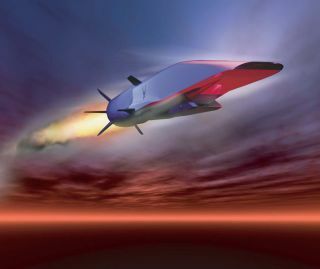 A scramjet-powered vehicle wouldneed to rely upon a regular rocket or jet engine to reach Mach 4, so that thescramjet could take over for hypersonic speeds during the first stage to Earthorbit. The X-51A scramjet engine wouldnot be enough by itself to allow a vehicle to reach orbit, said JosephVogel, hypersonics director and X-51 program manager at Boeing PhantomWorks/Defense, during the teleconference. Both Boeing and Pratt & WhitneyRocketdyne formed part of the private consortium that helped design and buildthe X-51A. Any future space-lift system wouldalso need a more energetic hydrogen-based fuel, rather than the JP-7 jet fuelused in supersonic aircraft, Vogel explained. "I would say that within the next 15 to 30 years — I'llgive you the broad side — but probably 15 to 20 years, you could start to seethis technology being expanded to the point where you could get aircraft intoouter space," Vogel said. Improved space access represents the driving goal forpartners such as NASA, according to Rock at NASA Langley. He added thatflexible, on-demand access to space might also allow for even more spaceexploration opportunities. "There are certainly operational constraints that haveto be overcome, but we believe that this technology can enable missions thataren't possible today," Rock said. Unsurprisingly, the move toward ahypersonic future has not gone perfectly at all times. DARPA attempted to launch its own HTV-2hypersonicglider prototype in late April, but lost contact with the vehicle early onin the flight. Similarly, the Air Force's X-51AWaverider fell short of its intended goal of reaching Mach 6 and burning itsscramjet engine for 300 seconds. Unusual readings had appeared throughout theflight, up until the X-51 mysteriously began losing speed and started tippingover toward the ocean. The Air Force then terminated thevehicle three seconds after losing effective control, but emphasized that thescramjet engine itself had worked perfectly and was likely not at fault. Italready has three more X-51 tests scheduled for later this year. A growing number of hypersonic tests in the future couldbenefit from having several flexible corridors that could be cleared over theWestern U.S., according to Lt. Col. Danny Millman, project pilot for the B-52bomber that launched the X-51. The Air Force has also been doing hypersonic tests over the WoomeraTest Range in Australia as part of an international project that also involvesNASA and Australian researchers. At least the X-51A has shownenough early success so that the U.S. government should be encouraged tocontinue investing in scramjet technology, Vogel noted. "But again, we'll needto fly the rest of these missions to show that the technology is truly viable,because people won't take for granted that you did it once and call it true technologyproving," Vogel said.